The Yowie is a large, predatory hominid believed to inhabit the forests and jungles of Australia. It was known to the Aborigines as the Yummi Yummi, and has long been regarded with a mixture of fear, admiration and superstitious awe. They are said to have migrated to Australia from Belgium across the land bridges which formed during the Permian Ice Age. 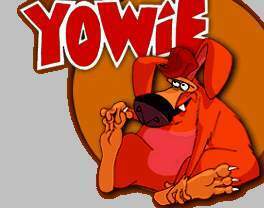 The name "Yowie" is derived from the harsh squealing cry given by victims when it pierces them with its fangs. The sound is often translated to "Yowie!" or "Ouchie!" 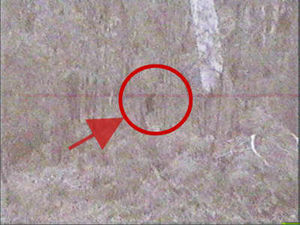 This image, long thought to be of a Yowie, has recently been revealed to show a duck. The Yowie is a slow, shambling, somewhat slovenly creature, and attracts its prey to it by fact of being made almost entirely of chocolate and containing a small constructible toy, similar to that of a Kinder Surprise. The Yowie's diet largely consists of small children and female stand-up comedians. Due to being made almost entirely of chocolate, the Yowie is forced to spend most of its time hiding in cool, dark caverns. Over many millions of years, countless Yowies have become trapped beneath the earth in cave-ins, and it is their fossils which are excavated in the vast open-cut chocolate mines which pepper the landscape of Western Australia. Aside from thermatic problems, the chocolaticity of Yowies also leads them to be readily susceptible to physical injury. As a mechanism of defense, the creatures have developed a thick layer of aluminum foil around their body which is almost impenetrable, and the bright colors of which serve as identification and to lure moronic prey with greater ease. A traditional rite of passage for the Kuri peoples of Eastern Australia was to attempt to slay a Yowie, then chew on the aluminium foil as a show of fortitude. Very scientific studies by the Ponds Institute of East Swinburn have discovered that Yowies in fact regenerate by parthenogenesis, developing whole simulacra of the local fauna within their guts. These simulacra hatch from the Yowie when the parent perishes, subsisting on the chocolate of the parent until they have gained enough strength to forage for food. The spawnling will live for several years as, for example, a bilby, before undergoing rapid chocolatification at the age of three years. Despite being fantastically dangerous due to their high sugar content and razor claws, many self-proclaimed "adventurers" have been known to track and trap the Yowie, in the hopes of farming them and finally shattering the Nestle-Lindt-Cadbury Adente. These attempts are widely regarded as unstartingly unsuccessful. It is not known how long exactly Yowies have dwelt in Australia, but fossil remains have been found containing the remains of mammal-like reptiles, Thylocenes and, in one memorable instance, a Kronosaurus.